Product #506 | SKU Z-DSLR-B | 0.0 (no ratings yet) Thanks for your rating! 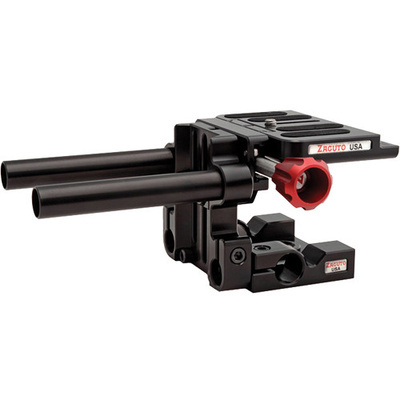 The Zacuto DSLR Baseplate provides the foundation for various DSLR rig configurations, from the Single Action to the Fast Draw and Double Barrel. And for good reason: its utility and flexibility are undeniable. Offering two threaded 3.5" 15mm mini-rails for adding follow focus and matte boxes, the Baseplate also provides a multitude of mounting threads on all sides for attaching accessory rods as needed. A quick-release plate lets you remove your camera instantly for standalone use, while the bottom plate mounts to your tripod using included 1/4"-20 and 3/8"-16 screws. Whether shoulder-mounted, handheld, or locked down on legs, the DSLR Baseplate is the nexus for stable, professional DSLR video. Baseplate has multiple 1/2"-13 threads on all sides: (1) 1/2"-13 thread on both the left and right side, (4) 1/2"-13 threads on the front (2 on top and 2 on bottom) and (2) 1/2"-13 threads on the back.